Maldives is a great place to learn to dive, because the water is warm, the scenery is fantastic and almost every resort in Maldives has a dive center. You can get a dive licence in around 4 days. It is recommended to contact the dive center before you get there, so they are prepared and have an instructor available for you. It can be pretty busy in the high season. Can anyone start scuba diving? Yes, as long as you can swim and have a normal health. Age and body size don’t matter at all. Most important is that you don’t have any respiratory or heart conditions. Most dives sites are only accessible by boat, and the dive centers will typically arrange tours every morning (one or two dives) and in the afternoon (one dive). There may also be day trips with 3 dives. Night dives are also arranged. Another option is to go with a group on a larger dive boat for a week or two. You can rent all equipment you need, but I recommend you to have your own mask and fins. Nothing is worse than having a mask that does not fit or fins that give you blisters. 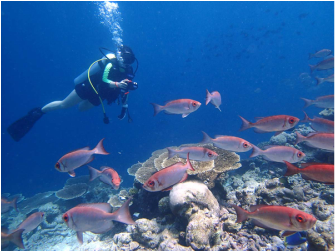 Scuba divers tend to return to the same place time after time, because they have good experiences there. It’s always reassuring to meet the same crew that accompanied you on previous dives. But why not try a different place next time? You may get surprised. Which places do I recommend? It would be unfair to say that this and this place is better than the other, because I have only been diving at South Ari Atoll (100 km south-west of Male) and North Male Atoll. Every place is a new experience.